So sweet Jenn! Looks like you two are having a fabulous summer. She is adorable. That is so good for her to get to do that. She’ll be creative like her mama. HI Jenn!! Ive been so busy, its hard to get around to all these blogs! 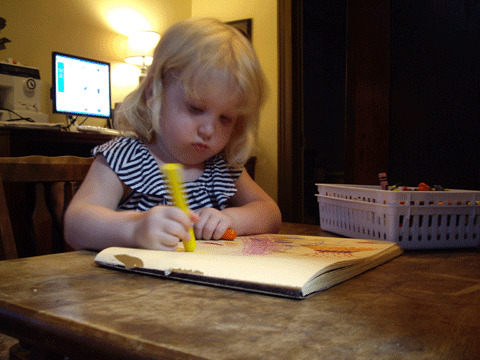 your daughter is adorable and it seems she will take after her mama and be an artist too! I have my little swap kitty from you in a place of honor so I see it everyday! I saw your book at JOanns and almost bought it, then I thought, I didnt think I would ever try felting unless someone sat and showed me.. (I hate to follow patterns and written instructions..) I wish you lived near by! then we could get together for tea and crafting! Well stop by and visit me sometime! ooooh, this is where it all starts!! she’s a mini-you-in-the-making!! so sweet!! yay for baby #2!! i know your new little bundle probably hasn’t arrived quite yet, but big congrats to you, your hubby, & Miss Clara! have a lovely little summer! 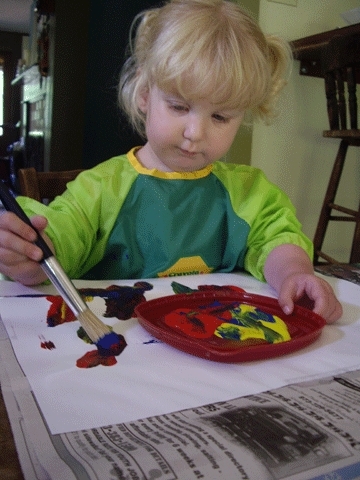 Just a couple of thoughts on letting little ones paint. Let her have analogous colors, side by side on the color wheel, so they always make beautiful colors. Also, buy a good quality watercolor brush, a size eight and a size ten are good. Use Michaels coupon to get a good pointy brush for forty percent off. Stay away from colors that are opposites on the color wheel until she learns that she will get brown. There will be fewer meltdowns when she has more control! Love your work.